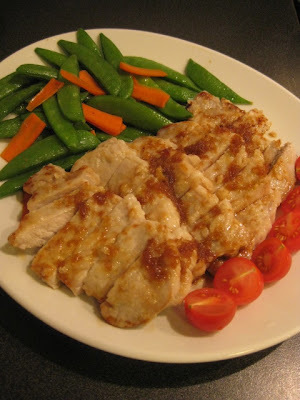 Hot summer weather makes me crave for Buta no Shoga-yaki (ginger pork). The sauce for this dish is normally a simple combination of sake, soy sauce, mirin, and grated ginger, but this time, I used my homemade ume Syrup (plum syrup made with ripe plum, Okinawa black sugar, and rum) instead of mirin. I also pre-seasoned and tenderized the pork with shio-koji, and the result was amazing. 1. Rub shio-koji both sides of the pork loin slices and put in a air-tight bag. Refrigerate for 4 hours to overnight. 2. Combine the ingredients for the sauce and set aside. 3. Lightly wipe off the shio-koji from the pork by hand. Heat the olive oil in a sauté pan and add the pork. Cook over medium-high heat for 3 minutes or until the bottom side is golden brown. 4. Turn over the meat and reduce the neat to medium. Cook for 2 minutes or until the meat is barely cooked through. Transfer the meat to a plate. 5. Wipe the pan with paper towel, and add the sauce. Simmer for a few minutes until the sauce is lightly thickened. 6. Bring the meat back to the pan and coat both sides with the sauce. Transfer the meat to a serving plate after slicing and pour the sauce.